After I have spent many hours on writing about myself and my own adventures, it is only naturally that I also create a section on this website about my doggy, who really means a lot to me and who is very important in my life. My doggy's name is Cindy, but you already knew that. 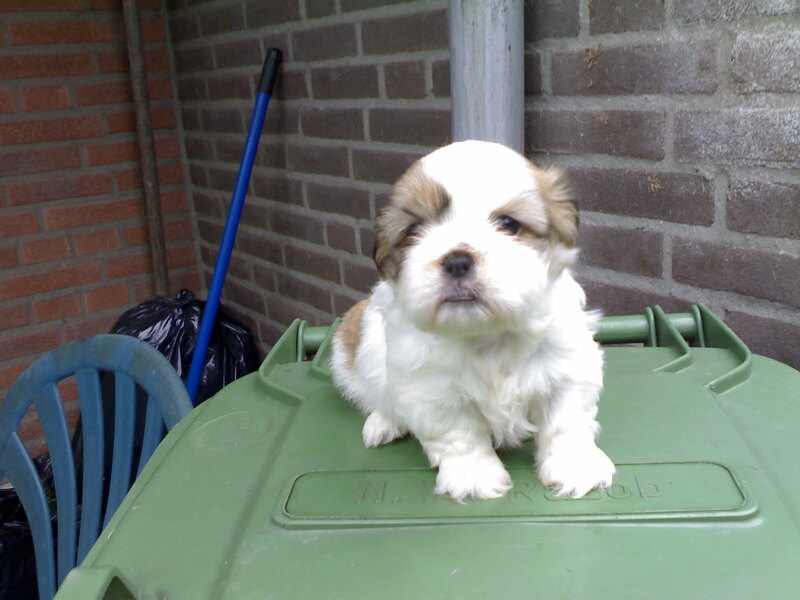 Ever since Marielle had Beauty, I somehow knew I wanted a Shih Tzu doggy myself one day, only at that time the situation was not very good. In 2004 when marielle had puppies I decided that if I should want a doggy, it would be called Cindy. In 2007 Marielle had puppies again and the mother was Beauty, and now the situation and circumstances in my life were somewhat better, so I took the chance and got me one of those puppies. cindy was born on Tuesday may 22nd 2007, at 8.05 AM, in the town Bergeijk in the Netherlands. she comes from a nest of 5 puppies, 2 males and 3 females. the 2 males and one of the females didn't survive for very long. At birth her weight was 160 grams. Her mother is called Beauty and her father is called Jack. her sister from the same nest is called Treasure, and she was born around 8.25 AM and her weight at that time was 180 grams. Marielle kept an extensive file with the information such their weight at birth and at several times after that, when they had injections and other important things. the first time I got to know Cindy, was when she was 4.5 weeks old. I went to visit Marielle together with alicey and Phil because I wanted to see her puppies and choose which one I wanted to have. this was quite a difficult choice because both puppies were really so sweet and nice. Finally I made my choice and the one that I decided on is now known as Cindy. the other is Treasure, but it might have been quite possible that it would have been the other way around. When Cindy was 6 weeks old I went to see her again, and now we also went to the Vet to get her first examination and injections. this time I could see that Cindy had grown quite a bit. 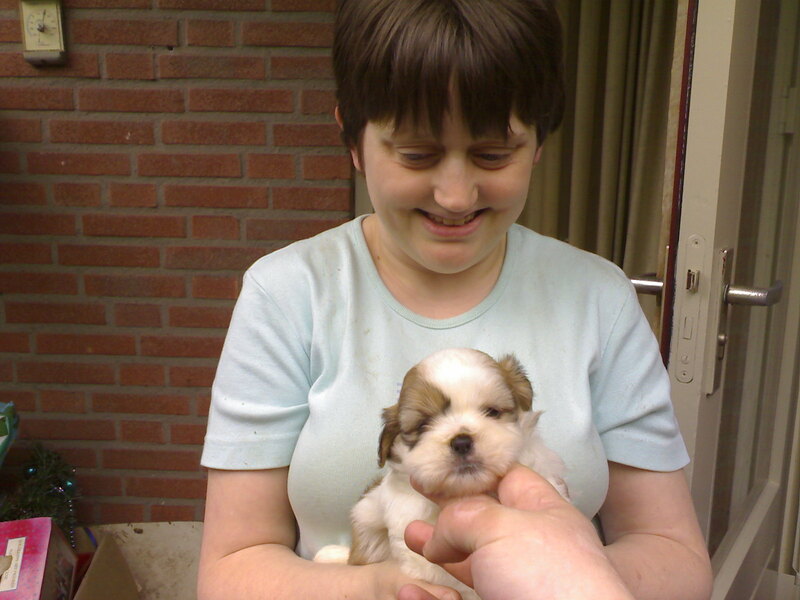 In july 2007, when Cindy and Treasure were both 7.5 weeks old, Marielle came with them and her other doggies to Alicey and Phil's home to visit us and to bring cindy to me. she was also there to help me find a cannel and other things I might need and to teach me how to do several things. During that weekend Treasure would also meet her new owner. I remember the weather being really good, too good perhaps. It was so hot, especially on the day that we took Treasure to her new owner, that it was hard to travel. This is also the reason why Marielle stayed a bit longer than expected and planned, it was simply too hot for travelling. During this weekend Marielle showed me how to get Cindy used to walking on a leash and we also soon discovered cindy was already quite used to her name. there was also another discovery we made during that weekend....Cindy liked to hide away in the smallest corners and places that were to be found. During saturday evening it took us 30 minutes before we were finally able to find her and discover her hiding place. Ever since then she has had a whole bunch of different hiding places, such as under the couch, under the keyboard, under the table, in de back garden behind a pile of stuff, in every corner that there is, under Alicey and Phil's bed and more. Worst of all was probably that whenever i was used to one of these hiding spaces, she didn't like it anymore and found herself a new one, making it sometimes really difficult for me to find her. Cindy was 8 weeks old when Marielle went home and I was sort of alone with her. Of course Alicey and Phil were there, I stayed with them during these first months, and I was glad for it, but when it really came down to training and practice it was up to me at first. Even though Marielle had done her best to teach Cindy several things such as her name, Cindy was still very young and there was a lot of work before me. the biggest troubles at first included getting her to come to me when I called for her and getting her to do her business outside and stop doing it inside. It took me a lot of focus and attention and you can believe me that I was glad that I had my cannel so I could put her in there every now and then to just breathe and relax and do something else. Whenever cindy was walking through the house loose, I couldn't go upstairs and I just had to sit there and watch and pay attention. It happened frequently enough that I didn't pay enough attention and I have been cleaning a lot during those first weeks. Keeping her from doing her business inside was hard, and I am also very thankful for Math and Marja and later on also my mother for assisting me with this challenge. But then again it was also not as difficult as some people tried to make it seem before I had Cindy. Another challenge was Cindy's way to get what she wanted. Although she has always been a very kind and playful doggy, at first whenever there was something she wanted and wouldn't get, she would growl at me and try to byte me, something that I of course wouldn't allow and punish severely. Another issue related to this was the fact that she would run from me and make herself hard to find at times when she knew that she had done wrong and I would punish her. Marja trained with me on how to get her to come to me more easily. But there have been a number of times where I have been crawling on hands and knees across the floor trying to get her, and curcing at her of course. Of course I never gave up on it and taught her simply that the longer she would continue to do this, the harder the punishment would be. It took only a few weeks to teach her not to grown and growl at me and a bit longer to get her to come to me. Making her come has become easier but still sometimes is a bit of a problem, especially when many people are around. But when I'm alone with her this works quite nicely by now. there were of course a few situations where Cindy would really act crazy or do things that she shouldn't do but were in a sense also funny. Once I caught her trying to eat my couch, you can still see the remains of it. Of course I taught her quickly to leave that and stay away from it. Also once she has been chewing on my slipppers that I take with me for swimming. Also one of the funny things is that she can miau like a cat, almost at least, and that sounds quite funny. She also would lick your ears or eat your hair if you would let her.... She is really a funny, crazy little doggy and one of her favorite games is trying to catch her own tail. In the picture above Cindy is already quite a bit older, this picture was taken in may of 2008. Cindy has never been in the habbit of eating much. So far she has always accepted the food that I gave her, but she is very small and at first I was concerned that she might not eat enough or get enough nutricion. the vet told me not to worry too much, and also not too feed her dog meat out of cans, although it is specially made for dogs, Shih Tzu's are a little picky and the more delicious food you will give her, the less she will end up eating in the end, wanting more and more delicious food and eating less and less. This has turned out quite truthful in fact. The more nice things she gets, especially if there is a pattern to it, the more she will simply wait for that and not eat her regular food. When she was almost 1 year old I changed her food from puppy food to the food for grown-up dogs. She still doesn't eat very much, but I think it is enough and also the vet says I needn't worry about that. Like most dogs, if I would feed her food that I eat, she would certainly eat that as well, or maybe she'd like that only better. Last, but not least, i want to add that cindy is a very important part of my life and a very sweet doggy. She always sleeps with me on my bed and never gets up until I start getting up. I have successfully taught her my sleeping in habbits and getting to bed late-habbits as well, and although many dogs tend to be awake at night walking around, Cindy hardly does that at all. Usually she will lay down beside me, trying to take my space away from me when I fall asleep, but then somewhere during the night she moves to my feet where I have a little basket for her and goes on sleeping there for the rest of the night. But she doesn't start walking around or doing crazy things at night. When she was really small I already allowed her to sleep on my bed, but then I kept her on a leash and during the first months I needed to have plastick on a part of my bed where she was, because it sometimes happened that she would do her business on my bed and of course I didn't want to ruin my entire blanket and so. Except for these minor training difficulties I have had with her, she is a very playful, loving and sweet doggy who is also perfectly able to feel and understand my moods and when I feel sad she comes to me to cheer me up, wagging her tail at me. Below I will put a few more pictures, the rest of the pictures including the ones here will all be together in the pictures section on my website.